Use a peeler to strip some skin off the cucumber. I made a striped pattern. Cut the cucumber into bite size pieces, and use a fruit baller to scoop out the inside flesh to form cups. To make the white bean hummus, drain the beans and put in the food processor along with the olive oil, vinegar, garlic & a pinch of sea salt. Blend to a smooth consistency. For the relish, chop up the olives, tomatoes and basil into small pieces. Add 1 teaspoon each of olive oil and apple cider vinegar. Season with salt and pepper to taste. 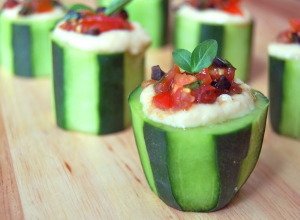 Fill the cucumbers with the hummus, top with relish, and serve!